Now you had to know it was only a matter of time before it was made known as to the reason why Trayvon Martin was suspended from school. I'm just wondering how long it's going to take for people to link his suspension to the reason why he's dead. SANFORD, Fla. (AP) — A family spokesman says slain Florida teenager Trayvon Martin was suspended from school last month for having a baggie that contained marijuana residue in his book bag. Spokesman Ryan Julison says Martin's parents believe the suspension has nothing to do with his killing Feb. 26 by neighborhood watch volunteer George Zimmerman. Zimmerman has not been charged and claims self-defense. The 17-year-old Martin was visiting the central Florida town of Sanford while he was suspended by Miami-Dade schools. He was unarmed. His killing has ignited racial tensions. 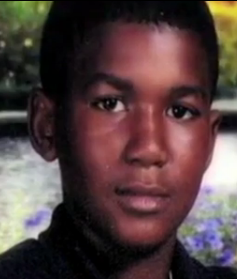 Martin was black; Zimmerman's father is white and his mother Hispanic. Also Monday, state Department of Juvenile Justice confirmed that Martin does not have a juvenile offender record. The information came after a public records request by The Associated Press. I'm not sure why the family would come out with this information. Maybe they were trying to preemptive. Who knows. It's not for me to question the family. Feb. 26, 2012 was a Sunday, not a school day. He was not somewhere that he shouldn't have been. Even if he was high as a kite, there was no just cause for him to be followed and confronted. Can't walk up to drug addict and kill him just because. His suspension is irrelevant. It is typical to badmouth the victim and even though the parents should not have to address this, I truly do admire their strength and resolve. We need to find out what kind of drugs Zimmerman was on.He was the one acting crazy and running a person down like he was on a man hunt to kill.He was the one acting crazy, he was the one going against authority. He was the one that took a life.